Beamer flash enhancer, originally uploaded by QuakerVille. 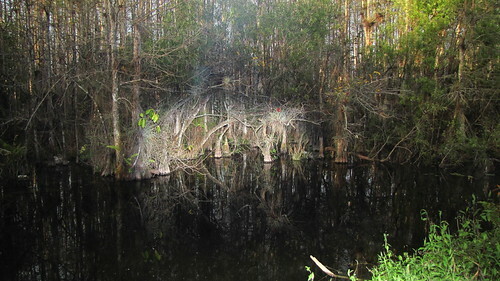 This is a shot in broad daylight in the Everglades using my Canon 580 with the Beamer. The Cypress trees are about 35-40 feet away and the lighted area is the result of the beamer kicking in to assist. Not only does it illuminate the Cypress trees but also adds to the reflection. Light works that way. When people see my camera and flash rig they ask me whether the flash enhancer, the “Beamer” really does anything in the daylight. My answer is always, “yup”. Here is an example of how well it actually works. 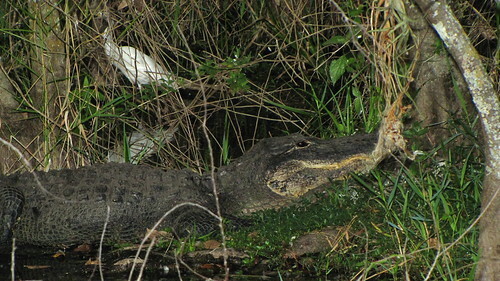 Check out this shot of the Alligator. He’s hiding deep within the Everglades Cypress trees. It’s dark and, even though light is streaming through the trees, I needed a little extra light 35-40 feet away. Enter the “Beamer” an extension on the face of your flash. It’s so cool and I never leave home with out it.